WASHINGTON (CNN) -- The Pentagon said Monday that Chinese ships harassed a U.S. surveillance ship Sunday in the South China Sea in the latest of several instances of "increasingly aggressive conduct" in the past week. 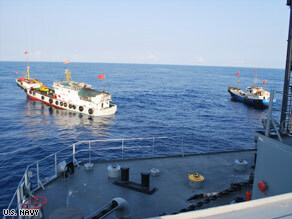 The Navy says this photo shows two Chinese trawlers forcing the Impeccable to make an emergency "all stop." During the incident, five Chinese vessels "shadowed and aggressively maneuvered in dangerously close proximity to USNS Impeccable, in an apparent coordinated effort to harass the U.S. ocean surveillance ship while it was conducting routine operations in international waters," the Pentagon said in a written statement. The crew members aboard the vessels, two of which were within 50 feet, waved Chinese flags and told the U.S. ship to leave the area, the statement said. "Because the vessels' intentions were not known, Impeccable sprayed its fire hoses at one of the vessels in order to protect itself," the statement said. "The Chinese crewmembers disrobed to their underwear and continued closing to within 25 feet." After the Impeccable alerted the Chinese ships "in a friendly manner" that it was seeking a safe path to depart the area, two of the Chinese ships stopped "directly ahead of USNS Impeccable, forcing Impeccable to conduct an emergency 'all stop' in order to avoid collision," the statement said. "They dropped pieces of wood in the water directly in front of Impeccable's path." A Pentagon spokesman called the incident "one of the most aggressive actions we've seen in some time. We will certainly let Chinese officials know of our displeasure at this reckless and dangerous maneuver." The U.S. Embassy in Beijing lodged a protest over the weekend with the Chinese government, a State Department spokesman said Monday. The Impeccable's crew is composed primarily of civilians and the ship itself is not armed, the spokesman said. No one at the Chinese Foreign Ministry in Beijing answered CNN's telephone calls seeking comment, and there were no stories about the incident in Chinese media. The 281.5-foot Impeccable is one of six surveillance ships that perform military survey operations, according to the Navy. It is an oceanographic ship that gathers underwater acoustic data, using sonar. It has a maximum speed of 13 knots -- or about 15 mph -- but it travels 3 knots, or 3.5 mph, when towing its array of monitoring equipment. It carries a crew of 20 mariners, five technicians and as many as 20 Navy personnel. The Chinese ships involved were a Navy intelligence collection ship, a Bureau of Maritime Fisheries Patrol Vessel, a State Oceanographic Administration patrol vessel and two small Chinese-flagged trawlers, the statement said. The Pentagon cited three previous instances of what it described as harassment, the first of which occurred Wednesday, when a Chinese Bureau of Fisheries Patrol vessel used a spotlight to illuminate the the ocean surveillance ship USNS Victorious. In that incident, which occurred about 125 miles from China's coast in the Yellow Sea, the Chinese ship "crossed Victorious' bow at a range of about 1,400 yards" in darkness without notice or warning. The following day, a Chinese Y-12 maritime surveillance aircraft conducted 12 fly-bys of Victorious at an altitude of about 400 feet and a range of 500 yards. The next day, a Chinese frigate approached Impeccable "and proceeded to cross its bow at a range of approximately 100 yards," which was followed less than two hours later by a Chinese Y-12 aircraft conducting 11 fly-bys of Impeccable at an altitude of 600 feet and a range of 100 to 300 feet, the statement said. "The frigate then crossed Impeccable's bow yet again, this time at a range of approximately 400-500 yards without rendering courtesy or notice of her intentions." And on Saturday, a Chinese intelligence collection ship challenged Impeccable over bridge-to-bridge radio, "calling her operations illegal and directing Impeccable to leave the area or 'suffer the consequences,' " the statement said. In 2007, the Pentagon filed a formal protest with Beijing over its refusal to allow a U.S. aircraft carrier to make a Thanksgiving port call in Hong Kong so its crew could spend the American holiday with relatives and over its refusal to grant refuge to two U.S. minesweeping ships that were caught in a storm. And in 2001, an EP-3 surveillance plane collided with a Chinese fighter jet and made an emergency landing on China's Hainan Island, where the Chinese held the plane's 24 American crew members for 11 days before releasing them. CNN's Yuli Yang contributed to this report from Beijing, China.